Stoutland in game: 285 Who? Important notice! Pokemon Stoutland is a fictional character of humans. Stoutland (Japanese: ?—??? 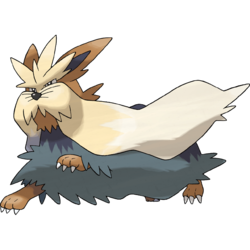 Mooland) is a Normal-type Pokémon introduced in Generation V.
It evolves from Herdier starting at level 32. It is the final form of Lillipup. 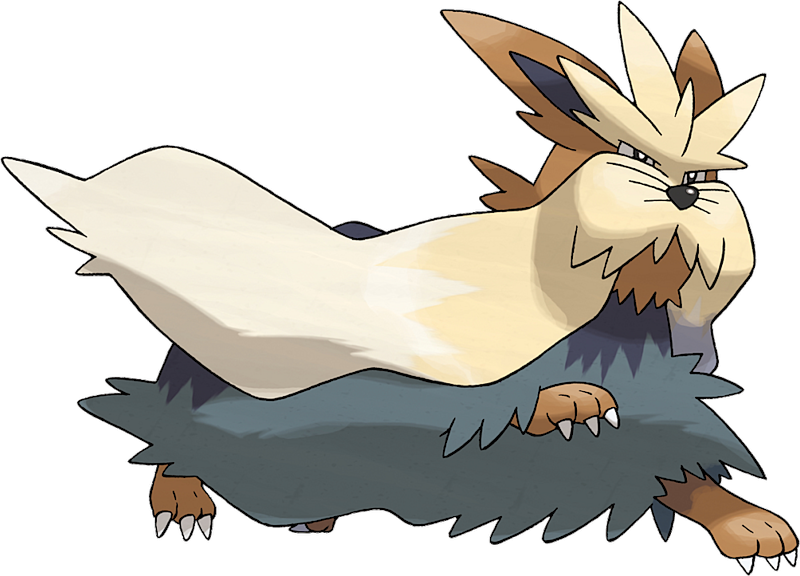 Stoutland is a canine Pokémon with a talent for rescuing people lost at sea or in the mountains. On its face, it has cream-colored fur that forms voluminous, white-tipped plumes and a three-pointed crest. The plumes are so long that they run the length of its body and bunch close to it. It has tufty, pointed ears with dark blue insides, and black nose surrounded by short black whiskers, and small eyes that are nearly hidden behind its facial fur. 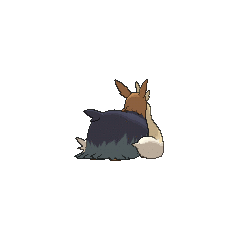 Its body is covered with shaggy fur that is dark blue along the back and grayish blue toward the legs. This fur is thick enough to protect itself and others against freezing temperatures. Its face and paws are light brown, and each paw has three toes with white claws. Blue paw pads can also be seen on each paw in Pokédex 3D Pro. 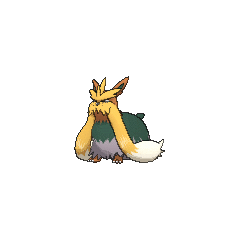 A Stoutland appeared in White—Victini and Zekrom and Black—Victini and Reshiram. It was used by Glacine and Donuke to pull their sled in the snowbound village in the latter, while it made a short cameo appearance in a similar role in the former. Stoutland debuted on TV in Reunion Battles In Nimbasa! under Burgundy's ownership. It battled against Ash's Palpitoad during the first round of the Club Battle but it lost. A Stoutland appeared in Lost at the League!. A Stoutland appeared in Mewtwo — Prologue to Awakening under Oscar's ownership. A Stoutland appeared in SM007. A Stoutland appeared in Jostling for the Junior Cup! participating in the Pokémon World Tournament Junior Cup. 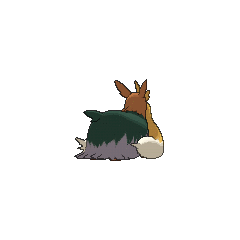 A Stoutland appeared in Team Eevee and the Pokémon Rescue Squad!, under the ownership of Davy. A Trainer's Stoutland appeared in Curtain Up, Unova League!. A Stoutland appeared in SS027. A Stoutland appeared in Kalos, Where Dreams and Adventures Begin!. BW039 Stoutland Ash's Pokédex Stoutland, the Big-Hearted Pokémon and the evolved form of Herdier. Stoutland is very wise and is skilled in rescuing people stranded in the mountains or at sea. Lenora has a Stoutland which she has owned since it was a Lillipup. It was used in Lenora's battle against Black in Wheeling and Dealing. Moves marked with a superscript game abbreviation can only be bred onto Stoutland in that game. For other sprites and images, please see Stoutland images on the Bulbagarden Archives. Stoutland was based on a combination of a shih tzu and a Maltese with some characteristics from Yorkshire terriers and Scottish terriers. Its talent for rescuing humans in the mountains is similar to a St. Bernard's. Stoutland may be a combination of stout (bulky) and land (a reference to terriers, whose name derived from the Latin terra meaning earth). It could also be a play on Scotland, as it draws inspiration from Scottish terriers. Mooland may be a combination of ? muku (shaggy hair) and land. Mandarin Chinese ??? Chángmáogou Literally "Shaggy dog".